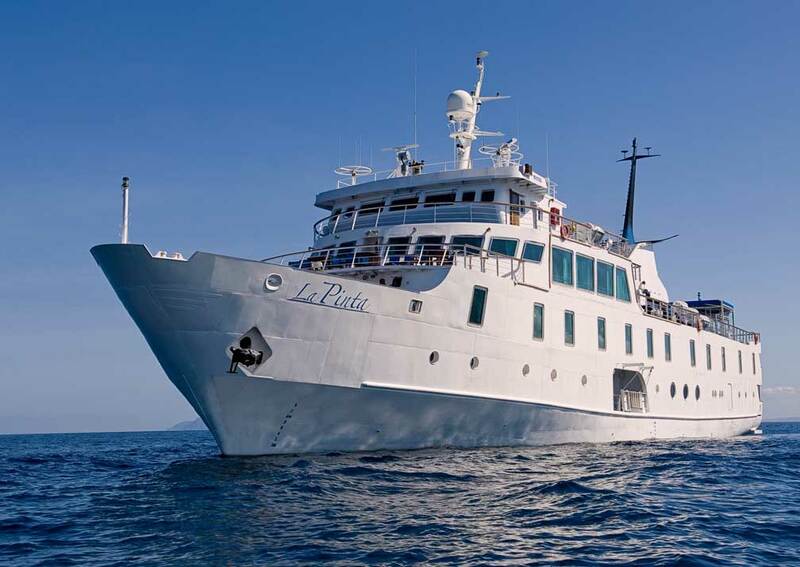 La Pinta is a popular ship with top class amenities and a crew of 24 looking after up to 48 passengers. She was completely refurbished in 2008 and is exceptionally comfortable. 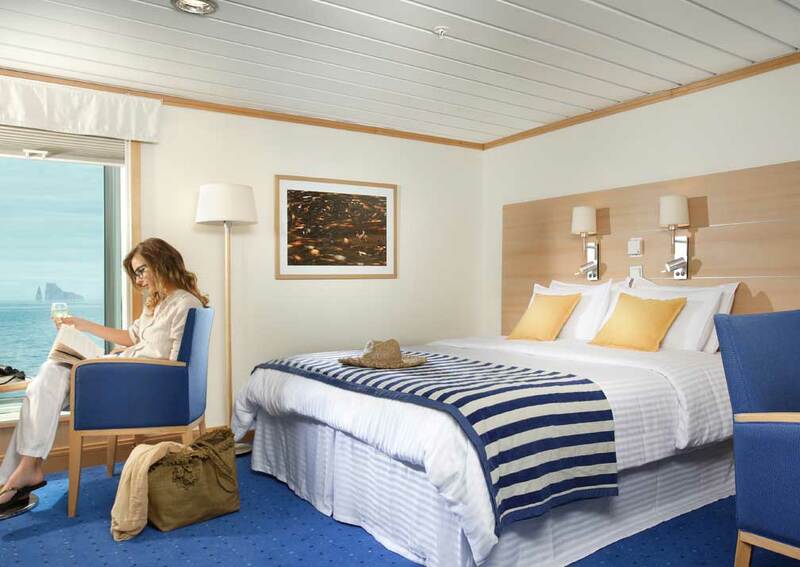 All cabins have windows, comfy seats, air conditioning and heating controls. There’s plenty of storage space and all have en-suite bathrooms. The main deck houses the reception and large dining room and upstairs there’s an observation lounge and bar plus a sun deck, outdoor bar and hot tub. Extra facilities include a library and conference room, a small gym and a shop. 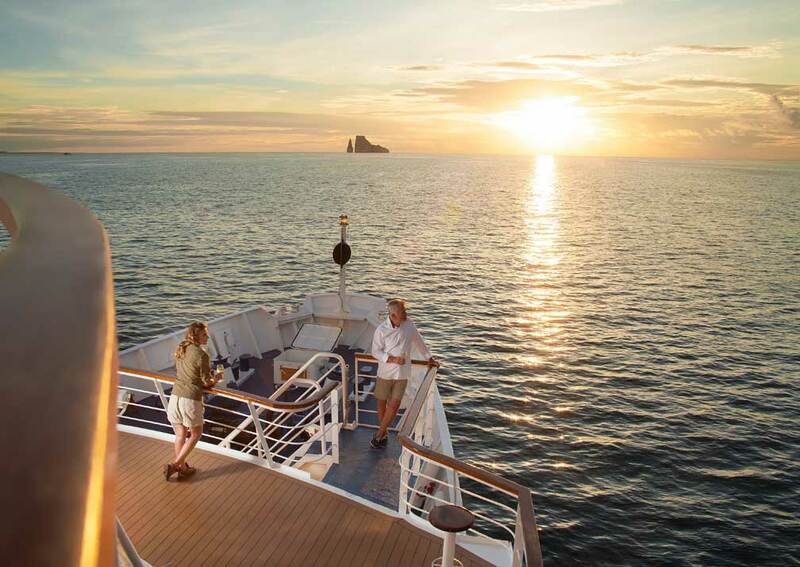 The crew are attentive and take pride in making your cruise as comfortable and enjoyable as possible. La Pinta has no fewer than 3 naturalist guides who lead shore excursions and are eager to share their knowledge. The boat carries snorkelling gear, kayaks and a glass bottomed boat to supplement island visits and give you additional ways to explore these fascinating islands, their waters and wildlife. 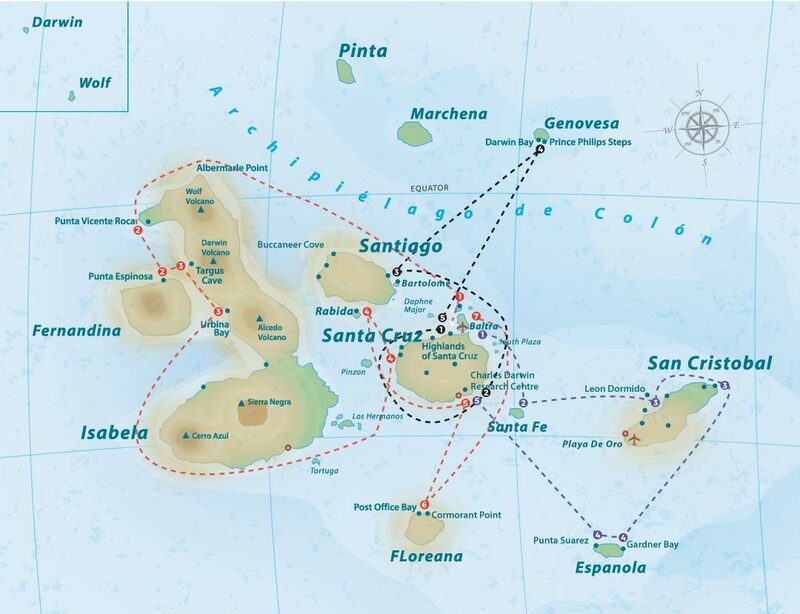 La Pinta also offers 4 and 5 day cruises. Please contact us for details. Please note that, although unlikely, the itinerary could be subject to change, even at short notice, for various reasons. A medium size ship with many social areas. 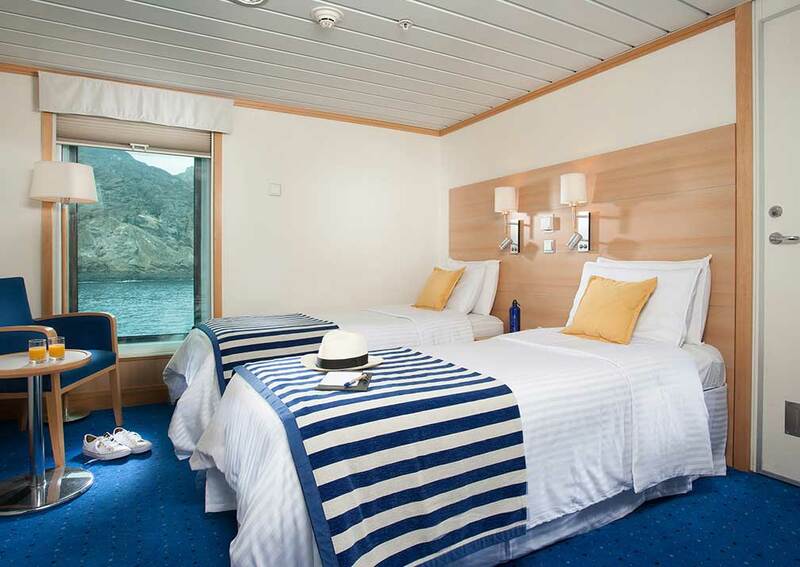 There are 20 double cabins, of 17.6 square metres, which can be configured as twin or double-bedded rooms. They are air conditioned, have full length windows, closet, MP3 sound system, reading lights and private shower rooms with hot and cold water. 4 of the cabins are interconnecting. All are on cabin deck. 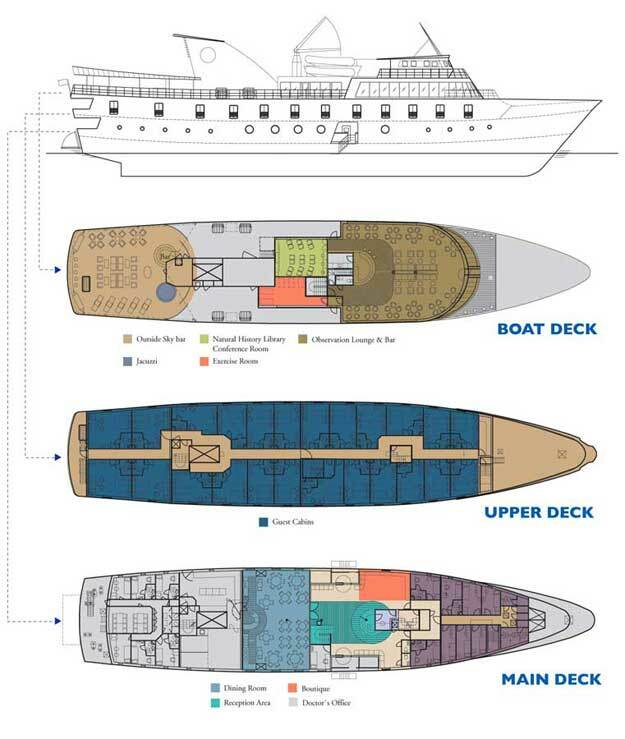 There are 4 triple cabins, also on cabin deck, located at the stern. They are 23.04 square metres. They main beds can be made up as 2 twins or a double as preferred, and there is separate sofa bed. Each is air conditioned, has full length windows, MP3 sound system, closet, reading lights and shower room with hot and cold water. 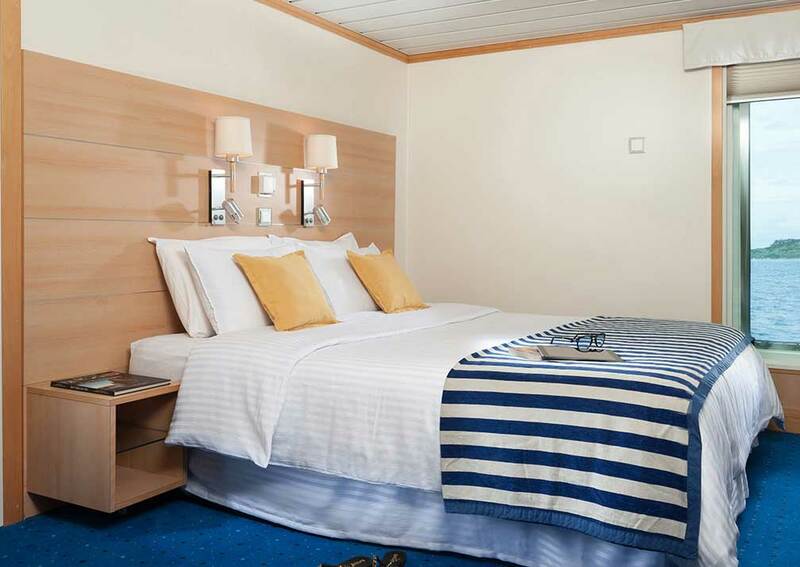 Accommodation: 24 cabins comprising 20 twin/doubles and 4 triples, all on the same deck. All have air conditioning, windows and en-suite shower rooms. 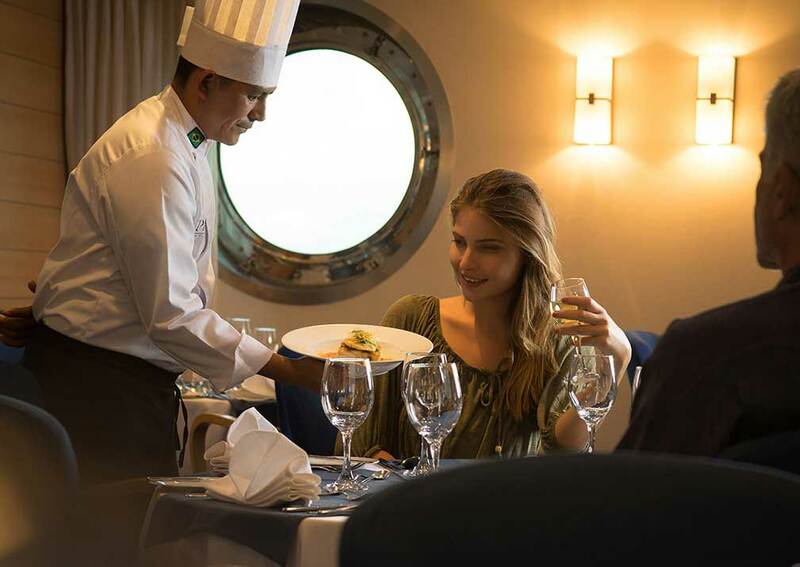 On Board: Dining room, reception and boutique on the main deck, observation lounge and bar, library and conference room, gym, sun deck, bar and jacuzzi on the boat deck.